He becomes the oldest winner at SW19 in the modern era. “He’s a hero,” Federer said of his opponent as he received the trophy. “It’s disbelief I can achieve such heights. I wasn’t sure I would ever be here in another final after last year,” said Federer who turns 36 in three weeks’ time. “I had some tough ones in the finals, losing two against Novak (Djokovic). “But I always believed. I kept on believing and dreaming I could get back. Cilic, who had spent four and a half hours more than Federer getting to the final, said retiring with his injury was never an option. “I never give up in a match. I gave it my best — it’s all I can do,” said Cilic who was still emotional at the trophy presentation. Email “Irrepressible Federer outclasses teary Cilic to make Wimbledon history”. 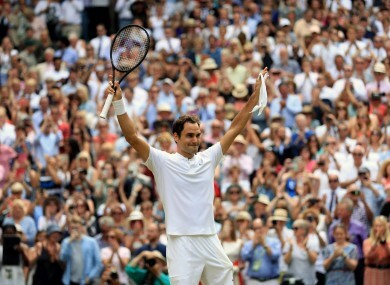 Feedback on “Irrepressible Federer outclasses teary Cilic to make Wimbledon history”.